We live in a world that is more connected more than ever. Especially in the field of business where money is the common vernacular, no distance is simply too far nor is there a cultural barrier to any enterprise willing to make some bucks from customers. To become an enterprising unit, therefore, is to compete in a larger stage that is not always overtly seen from the outset. Whether directly or indirectly, businesses compete with one another in order to survive a world where the fittest survive and the losers perish. But, although nuanced, there are also other elements which make competing in the global stage a more difficult ordeal than just facing competitions. With the internet as the common pipeline, establishing a business globally has become easier than ever. But, while the internet may itself adhere to a kind of universal culture, this does not necessarily apply across the board. For instance, in dealing with customers from a culture you share values with may be easy enough due to familiarity. But dealing with different cultures from another country or continent may altogether give off a unique experience. Simply put, if you are close-minded about other people’s beliefs and way of thinking, the chance is good that you might encounter friction that may go against yours. To learn the nuances between cultures, including language, of your target market is, therefore, a necessary aspect of going global with business. When you speak of dealing business with countries which are considered sovereign, chances are you’re subjected to a plethora of rules, regulations, and taxations that are inherent to that country. The magnitude of these guidelines you ought to follow also increases significantly when you refer to various countries which themselves have a unique set of rules and regulations you are expected to adhere and follow. You can, therefore, imagine the challenges of expanding a business empire across different lands and thus what makes well-established conglomerates epitomes of worldly success. Having multiple branches of a single business as spread across borders require a centralized form of communication in order to work effectively and efficiently as a single collective unit. Especially when each branch does not necessarily work independently from others, the need to consolidate bits and pieces of information from business is of utmost imperative. But establishing this means is not always easy even in today’s advanced technology. This is especially truer among poor countries which requires a more robust communication infrastructure in place. Unless you are in a business which does no harm to the environment, taking concerns for the environment should be least of your problem as a business unit. But if yours is one which has direct repercussions to the green world, expect to experience opposition from environmental rights group. Typically, for many countries, the issue would revolve around the issue of energy use, green packaging, and recycling. Expanding business means finding new clients or customer / consumer and gaining incomes. Before competing globally we must know first the marketing mix strategy, wherein the company must take arrangements or strategies to promote its product in the market. Marketing mix has this 4Ps that can help the company – Price, Product, Promotion and Place. The company must know the right product, setting it in the right place, for the right price and know the activities or strategies that can help promote or advertise the products or service that the company offered. The other concerns of Filipino business people when competing globally are the physical distance, understanding marketing and choosing the right countries to deal business. 1. Physical Distance – we all know that internet, telephones, fax machine and etc. are ways to communicate but it is better if the business people can talk or discuss in person with their distribution partners. 2. Understanding Marketing – business people must familiarize the buying practice of the country that they want to expand for them to compete with the other businesses. 3. Choosing right countries to deal business – you must have a lot of research where is the best place or country you are planning to expand. Does your products or services offered need by the local consumer/customer? Research their labor and employments laws, restrictions in importing and exporting of products, business practices, custom laws, tax laws on products, services and other regulatory requirements. The government can help local business by offering them a low interest loans so that they can innovate their business. Provide free business assistance like for economic development, in some ways it can help them start to grow. Education, Trainings and Seminars, government can provide training programs to the workers, and seminars for them to acquire ideas in their local customers, suppliers and dealers. Reality speaking, Philippines has been lagging behind in terms of innovation. The Philippine may have a steady and good economic growth for last few years but doesn’t mean that some of our businesses can already compete globally. When competing globally, the fiscal policy imposed by the government plays a significant role in the trade. Government must be thorough in the imposition of taxes and must be reasonable to avoid conflicts in the international market. Setting the tariff too low and too high can destroy the economy in terms of balancing finances. Getting the right tempo and rhythm in implementing those policy should be done to avoid creating unstable economic status. One thing that Filipino businessmen should focus in making their business competitive is to be unique. Statistics says that Philippines has been considered to be one of least country that invests on Research and Development. What does this mean? It means no innovation. In today’s generation, innovation will make you on the pedestal and those who lag behind will have to suffer the consequences and will just have to adhere on what’s on the market. In lieu with research and development, what the government should do about this is to improve the education and training of the people. Research and Development are done by the people not by machines or any technology because they are just equipment that needs to be utilized while manpower has the intellect, capacity and ability to maximize their usefulness. I firmly believe that finding our unique market niche will make Filipino products and services known world-wide. The issue which Filipinos needs to address aside from what is presented in the article in competing globally is infrastructure=transportation of goods. It should not be all for the government to do, true! however it is also true that 90% of the success of Filipinos vying for the augmentation of their business through exportation comes from the governance and leadership management , protection and assistance of one’s country. Just like what happen to China as discussed last meeting the reason why they became the export-import hub country is their lower tariff and easy trading system across borders. I think the other concerns which filipino business people has to address when competing globally, in order to explore the name of your products in other countries, not only in the Philippines but in the global economy. The government should do for local business, the government should do for free advise for the regulations of the local business. Examples for the tax incentives program, or the research development grants from local government unit. Financial assistance that the governments grants for the local business. Nowadays, social media is very powerful for the business globally. Through internet you can communicate your distributing countries easily. And of course you need to practice their language so that it will easy for you to communicate each other and to know their culture as well is easy enough for you to familliarized their own delicacy. Speaking legalities for dealing business with other countries is considered as sovereign. If you have dealing business you need to follow their rules and regulations, and taxations that are inherent to that country. Through communication and technology is very important for the global business, because without communication the business cannot effective. Because of our high technology, it will easy for us to expand your business to other country. If you are dealing with business you need to consider your environment, because taking concern for the environment should be least of your problem as a business unit. So we need to consider our environment as our business partner. There are some concerns Filipinos are having in terms of competing globally. Concerns which Filipino Business People has to address when competing globally are: 1) Product to choose. We have to choose the right product to export and have a business plan. We cannot just say we should export goods that we like and with no business plan. In order to have great productivity, Filipinos must have business plans; 2) Investment of Money. Make sure that the money you invest is worthwhile. You have to know the pros and cons of investing your money to avoid bad decisions; and 3) Management. There should be benefits and good income for the employees to really operate the business properly. You should know the benefits of the employees for you to transact better in your business. Employees would really appreciate if you take good care of them properly in the company. They would work hard and work for a very long time in your company. The government must always conduct seminars every year for the local businesses. It would really help their business by enhancing the knowledge to apply for the business living. Competing on a global scale means staying on your toes. With increased and intensified global competition, the challenge on global entrepreneurs is on how to differentiate their products and services. Before a world-known company have found a good standing in the international business realm, it surely has started from rags, committed several trial and errors, have gone a long way before finally conquering the diversified world. Even up to this date, competition remains to be uneasy as we live in an ever fast-changing world with high innovation demands. Many times have we been surprised by the fact that most of the top companies emerging in the global arena are actually managed and owned by a Filipino. 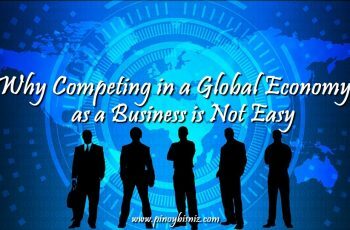 But with the whole world as your competitors, there are numerous concerns filipino business people address in competing globally. One Filipino businessman for example, who is leading the Association of Filipino Franchisers Inc. (AFFI), the country’s leading franchise group in the person of Armando Bartolome, who has helped Filipino franchise brands expand operations overseas, shared that “Operating a franchise overseas comes with a unique set of challenges. These include not only different laws, languages, and cultural differences in how business is conducted but most importantly, its also finding a franchisee to partner with,”. Choosing your partner abroad is crucial for he/she shall help in translating the concept and your brand into an acceptable and profitable commodity in his/her area scope. Its either your partner can make it or break it. Different markets have different needs of course, so our relationships with our partners can be recipe for success or disaster. Selection of partners with the right qualifications might be rigid and be stressful as it can be, but it can make a major difference to building a strong franchise. In this regard, the government, being a powerful law implementing body, plays a huge role in the upliftment of local business in the Global market. Our local governments must increase its diversification efforts through collaboration with the national agencies such as Department of Agriculture (DA), Department of Trade and Industry (DTI) and Department of Tourism (DOT), as they are key managers in the improvement of what our nation has to offer. The government can also be an instrument in boosting participation of our local producers to international trade exhibitions through allocation of assistance and support to deserving local producers. It will not only open opportunities to transact with the world’s biggest buyers, but it is of big help in enhancing linkages and establishment of stronger partnerships. The Department of Tourism can also have an influence to airing of videos in the social media, to further promote Filipino food products and cuisines. Competing in a global economy may not be as easy as it may seem, but Filipino’s world-class talents, there is no barrier they can not hurdle to be effective players in the local and global business. Since our business requires you to export globally a supervisory oversight is needed. In order for a busines to progress well it needs someone who will look after your business and to give you insight and updates how your business operates in your target market country. Our government can be of help by strengthening our ties with other counries, mus take part in unions like the WTO and ASEAN. There are really a lot of factors to be mentioned that a lot of business people should do when competing globally in the market. One thing that the mindset of a Filipino businessmen is to eliminate the thought of they want to be like everyone else in the market. Uniqueness will make you more succeed in the international arena. Also, government has to help these businessmen to achieve those goals especially those local businesses in terms of their production and tariffs imposed. Going global is never easy especially for Filipino Business People where some concerns hinder the success of their business internationally. While engaging your business in a broader sense may seem to open new opportunities and chances there are obstacles which comes along with it that needs to be dealt with and the ones who have succeeded will be the one who will be have the pleasure of benefiting from it. Working with people across the countries with different time zones as you is such a challenge and a difficulty. Imagine when you need to reach your contact in other countries which are on 12-hour time difference as you are. 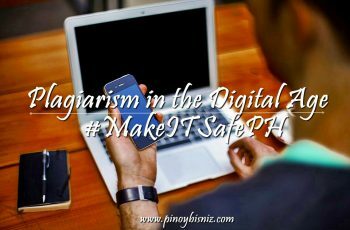 It is either you here in the Philippines will be the one to adjust your time for you to work at the same time. That’s where the problem comes in because you can’t be able to work simultaneously and efficiently since you will have to wait for the availability of either of your contacts in and out of the country. A currency rate affects the Filipino businesses across the country because of the inconsistent equivalent value of Philippine peso compared to other currencies. This will affect the cost of expenses while and during the process of doing the business as well as the amount of revenue you will gain from that business. Speaking of infrastructure development, the Philippines falls way behind especially with those developed countries. Just take for example our transport system of conveying goods from one place to another where it is always late or delayed affecting our products. Airports as well as seaports which are overcrowding now of excessive number transactions everyday is one part of limitations to business. To be able to help the local business, the government can maybe provide loan reinforcement especially to those start-ups and even established companies locally who wants to expand and venture globally. Business loans with at least low interest rates will help provide and improve the locally established business its capital to perform and compete well globally. Getting finished goods to the market and/or plants quickly means the business is doing better since raw materials moves faster and efficiently. When government helps to improve infrastructure such as maintaining roads, seaports, airports, and bridges, it follows at some point that business will flourish because it will have less tendencies of delays. Education and training plays a very important role in the success of businesses. It pays a lot when businesses have access to government training and seminar programs where they can gain important inputs to help strategized their business plans. Since government research and development are working to develop new techniques and technologies which will help and benefit the business industry, they usually ties up with educational institutions to get free work training for business’ owners and employees. Competing globally is never easy. Below is an example of a challenge and a suggested action plan to our government so it can help our local people in making it sucessful in a global scale or perspective. 1. Enough Capitalization- Turning your product to be a globally competitive output will require higher standards to meet. Most of the times, higher standard would mean higher over head cost to ensure quality of service. Suggested Recommendation: Government should allow our potential exporters to loan in a low interest rates. Making tge documents needed to prucure the loan should also be made easier to ensure that they can deliver the output in a timely manner. We have to remember that it is the obligation of the government to help its people however, it is our moral obligation to ensure that we are soing our very best to help ourselves. 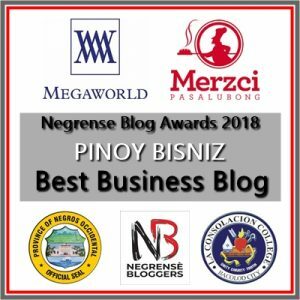 With the above mentioned issues, Filipino Entrepreneurs or Business people faces dilemma with the other business people who have positioned themselves in the global market. Citing specific experience of a Filipino Tycon – Ton Tan Caktiong – founder of Jollibee Foods Corporation (1975), it also faces legalities issues and environmental considerations as they have expanded their branches in the United in the States. Merger and Acquisitions has been tough for the corporation as reported by the Asian Review. Major competitors were mentioned but Jollibee seemed to position itself in the market by its strong brand, and in principle, Jollibee believed that if “you cannot beat them join them”. In order for Jollibee to be truly a global player, it must not only please the taste buds of the consumers, Jollibee has to really be consistently maintain the quality of its food, perform and abide with the legal requirements for its staffing. The Philippine government must see to it that the international standards or procedures in supporting local business people will be properly handled and these people will not be given a hard time in so many red tapes and others in processing the expansion of their businesses globally. reports. On my own opinion, the government should focus more on locally products for more exports to be made. In addition, the government should give seminars for the awareness of the business when it comes to packaging and the laws of other countries and helping SME’s will greatly help the country’s economy. When competing globally, the first thing that comes to my mind is – you have to be unique, you have to be something special or different that people will go for your business not just for a season but something like a necessity to them. This what makes your business go global without the stress of even competing. If you want to be known in the local and international, you have to be unique and always take the leap. Other concerns I can add on is who is your target market and you should do a market research and find out where your products/services in demand. Also hire a good lawyer. This always comes into my mind especially when it comes to legalities. A good lawyer can set up terms and conditions on how to’s and dos and dont’s in venturing globally. Since most of the time our government do not support Filipino Business People unless they do not have their part of interest. Government should give full support on Filipino local businesses in ways that they are motivated because of the opportunities in international. They should give attention to those making the country be known globally and gives pride to its country instead of fighting and having war and hatred in one another. How would they’d be able to give attention to this when everything you see and hear is hatred and war. To be honest, if you do not do the work on your own. You will never be success in what you are doing. So take the leap and take the risk. 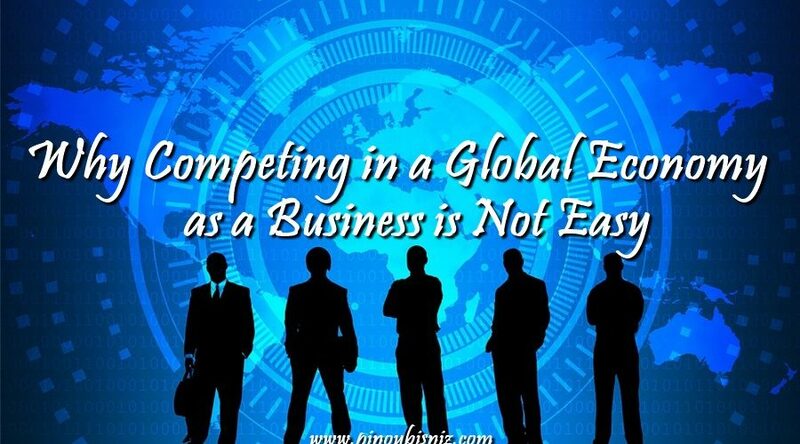 There are a lot of factors why is it difficult for companies to compete globally. One thing to consider is the cost calculation and global pricing strategy. Setting the price of your product entails an additional strategy for businesses. Price should always be competitive but it must still give profit. This is one of the major concerns since you have also to set a benchmark in order to remain competitive with other local direct exporters. Another challenge in global competition is the structure of your organization and your team location. Some will consider this challenge as costly to implement and difficult because of the differences in culture of your target markets. Political instability and uncertainty also brought a problem in international competition. Unstable policies and corrupt practices will lead to different types of circumstances in the emerging markets. Changes in government will also change the country’s regulations. The government should improve the labor productivity by spending in education and training, encourage business start-ups and promote a flexible labor market. Deregulation of barriers to entry and reducing of monopoly power must also be done in order improve dynamic efficiency in the international market. 2. Apart from the issues presented in the article, what do you think are other concerns which Filipino Business People has to address when competing globally? What should the government do to help local businesses? One of the factors that makes international business hard for Filipino business people is the transportation of goods. Transportation of goods is not easy since you would need to transport the goods from one port to another until you reach the destination. There are several factors that can affect the efficiency of transport, we have amount of time of transport, this is important especially if your products are perishable goods. Weather is uncontrollable, Philippines is somehow the testing grounds of storms and typhoons on how strong they are, considering this situation, it is not easy to transport goods all year round. There is a cheaper way to transport goods that is by using roll-on roll-off ferry service (ro-ro). There has been a significant development in the roll-on roll-off ferry service (ro-ro) as they do inter-island shipping service within the past couple of years, more island have been linked. The government can continue to develop new ideas in the continues development of our water transport, this way, exchange of goods will be more efficient may it be locally and internationally. The article has presented issues in engaging as a business in a global economy such as language and cultures, legalities, communication and technology, and environmental consideration. For me, another concern which Filipino Business People has to address when competing globally is the issue of financial constraints in production towards competitive target markets where similar products are being offered. A manufacturer that produces a product in a lower cost has an optimum advantage. Lower costs means better pricing in a way that such manufacturer can play with the price of its product in the target market. For developed countries that has advanced technology that can deliver a product at a lower production cost than a product produced by a Filipino Business, such shall create a threat to the standing of the Filipino Business in the global market. When a Filipino Business collapses, it has effect to the Philippine economy as probable foreign valuable currency earnings shall decrease. The government shall take precautionary actions to this threat through providing financial assistance to Filipino Businesses that engage to global economy. It can provide assistance by conducting free training to local producers for efficient and effective production and financial assistance through socialized credit among accredited local businesses which shall be used in acquisition of advanced technology that shall also give an advantage in lower production cost than usual. I think what concerns Filipino business people is how to maintain a competitive advantage in the global market to generate profit. With the fast-growing industry and productivity all over the world, global competition makes it tougher. Inflation also affects Filipino business because if the prices of the commodities increase so does your raw materials and wages for production increases. High prices of products and services will make you uncompetitive in the global market. The government should establish programs to support local businesses to increase profit and to solve existing problems. Promote local resources to help develop communities. The continuing challenge for the Department of Agriculture is to focus on increasing the productivity of farmers and lowering the cost of production. And high production cost could not compete with our Philippine counterpart. This will not only produce sufficient supply but we can export. Support sectors with facilities and machinery needed to contribute production. Expand platform investment and provide programs like low-interest loans to producers to sustain production cost. Collaborate with schools and private sectors to enhance learning. Invest in infrastructure for internet access for better educational opportunities. 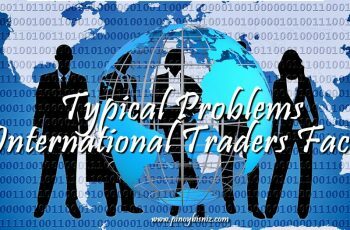 Apart from the issues stated in the article (the language and cultures,legalities, communication and technology and environmental consideration)the other factor that causes difficulty for competing to global economy is that, are the other traders or the competitors. Knowing both sides strengths and weaknesses then you might have this courage to take action knowing what strategy to make and to overcome threats of failing. Filipinos should be more eager to improve their products, learn alternative courses of action and willingness to take risks. Your one of the global traders that you have to play in it. With regards to this problem the government should support its local products for competing globally by providing assistance in resources, manpower and financial by finding countries to market products to sell or services to offer. It does have know how for contributing help to traders knowing that they have bunches of connections to other alliances or other countries. Through this, Filipinos will have the idea what to do for the particular country where they are planning to market, its diversity, the culture, legalities,communication and technology, and its country’s environmental considerations. Filipino business people may also encounter these concerns in competing globally: In choosing the right products or goods to sell in other countries. What is fitted that considers their cultures, profitable and in demand to the target market to penetrate. Another is the capital for establishing a business that go for global. Hiring employees or staff is also one of the concern in doing a business because you need people who are highly skilled for that particular product to be market, to help you in the operations, process and to other tasks related to the business. In order for local businesses to have its success here in the country and to the global, the government can offer a financial assistance like loan programs that has low interest rates, they can also provide free education and training programs for entrepreneurs who wants to compete in the business global, fast processing of the licenses and permits but still in the legal way and improve technology and telecommunications systems for effective communication, good customer service and productivity. Competing on a small scope of area is already hard how much more in a global scale. 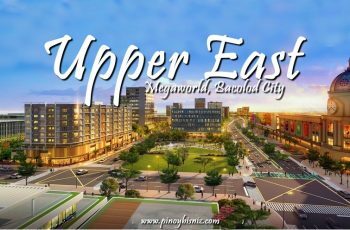 Other concerns which Filipino businessman has to address is having less connection to other countries. One way to achieve a successful business is to have a lot of connections all over the world because they will be the one who help for expanding the business and act as a middle man between you and your possible customers. Another is, conflict between countries. It is difficult to export products from the Philippines if the country of destination has an issue in the Philippine Government and theirs. The government should take action about this matter because it really affect the businesses’ sales when in fact, it has nothing to do with whatever issues the countries have. Lastly, the safety of the products from transporting it to other countries. It is important to choose the right and trustworthy shipping company when exporting your products. Some employees of shipping companies do not handle the products with care. They just throw it and sometimes they break it and when the product reaches the customers’ address, the products are already ruined and useless. The government should make or formulate laws or rules for owners, stakeholders and employees in proper handling of products. First, safety business location. A series of terrorist attacked was being noted all over the world. Consider the safe environment in the planning stage. Second, identification and compliance of the legal requirements. It can help you to avoid problems and delays when the business operation have started. Third, conduct audit to the prospect business partners and suppliers. This is to help you to evaluate their management system and be able to know if the business is legit. In addition, Government agencies should assist Filipino business people by providing assistance needed in this areas. I think education is the key in competing globally.To prepared ourselves to a world standing and competent in every different field of industry. The government must focus and invest education rather than infrastructures for my own opinion.Filipino , ideally must be more fluent and knowledgeable in speaking English as one of the most important language in communicating around the world. Local government need to improve stability of economics by helping farmers gaining capital , improve production and advance the technology that is being used.Furthermore, helping other business to grow and develop, to seek more opportunities not just in the country but also across the world. Q1. Apart from the issues presented in the article, what do you think are the concerns which Filipino Business People has to address when competing globally? A1. Currency issues might be one of the concerns of Filipino Business People nowadays, since the fluctuation of currency rate increases every minute, hour, and day without warning. All Filipino global businesses who were engaged in imports and exports experience huge imbalance business expenses and profit and probably could lead to economic failure..
Q2. What should the government do to help local businesses? A2. The Bangko Sentral ng Pilipinas would rather purchase massive foreign currency to maintain stability of exchange rates and/or the BSP would negotiate to other countries regarding foreign exchange swaps who has an increase on their exchange rates. The Philippine Government must be more open pertaining to their foreign exchange government to alleviate foreign exchange pressure so that the local businesses could have free access to foreign exchange and over-the-counter transactions. Aside from the issues stated above, we have to take into considerations also the differences in time and also in distant. We cannot deny the fact that technology is one of the helpful tool to connect globally. We can communicate through emails also in video conference, however, in business it is better to connect personally in order to build relationship and trust. To consider also if there is projects that both parties are needed to coordinate and collaboration is necessary. Budget also is one of the factors to consider in competing globally. The fluctuation of exchange rate can affect the business globally, the different structure of business tax for different countries. For the government to help local businesses, they should connect or cooperate to other private sectors, organizations or financial institutions that can help them sustain and support the market systems. And also to give local businesses a lower interest rate, tax incentives and friendly trade policies that encourage in order to expand its businesses. Question: Apart from the issues presented in the article, what do you think are other concerns which Filipino Business People has to address when competing globally? What should the government do to help local businesses? Ans. Taking your business across borders is not that easy. A lot of factors needs to be considered and careful planning should be done. Before anyone ventures their business abroad following questions or considerations needs to be addressed. First is to develop an international business plan that would define the company’s present status and internal goal and commitments that would help them measure the results of their success. Second is to determine the amount of investment that you can allocate in your expansion efforts. Third is to decide what product or service you want to take overseas and to conduct market research that would identify your primary target markets. Gather relevant data that will help you predict on how likely your product will sell in a specific region. After that you also need to create a follow up strategy or after sales service plan that will help you determine if customers will keep on coming back for more. As to the government for them to help the local businesses they can develop or regulate friendly trade policies by lowering tariffs and import quotas that would encourage local business to participate. Lower trade restrictions and free trade zones can allow local business to get significant cost savings and will help them increase their profit. Government can also provide loan programs to small business and they can also encourage local banks to provide assistance and to give lower interest rates on startup businesses. Providing loan grants to small business is one of the ways to use tax revenue that would help stimulate and encourage business activities. The other concerns of Filipino Business people when competing globally is identifying a true market needs. Before starting a business globally, the company must first know the true need of customer or consumer in a specific country. Because people in other countries needs is not the sames as what your country needs or wants. For example, if one company is selling their best product on their country then they plan to expand globally, and their products is not the country need, they are in the wrong market. They’re never be successful. The government can help by giving or conducting seminars, trainings and activities for the local businesses. Seminars that can relate to the local customers, suppliers, dealers and markets. There are many things to consider in doing business Globally. Do a research about the country and its culture, know the market of your business, your competitor, and study to identify your main target market. The best thing that Government can do is to implement a programme that can help to encourage the local businesses such as; free training, infrastructure solution and tax incentives. Interconnected. Doing business in the international arena is much easier today as compared before especially during the times that transportation and technological advancement is not yet at grasp. Businessmen dreams to do business in the global arena, they are becoming risk taker and ambitious, which is actually good. But there a lot of concerns to be considered, and for me the two most common concern they need to consider is company resources and the type of product/business it has. Evaluating your own resources is a must which includes your financial resources, human resources, technological resources and other resources necessary to compete with other businesses. Thinking globally is good, but one must consider if it really have the capacity to become a global company. Businessmen who plans to go global should ask themselves, do I have the money, are my people ready, is my knowledge enough? This is very crucial. Second concern is the type of product you are going to sell in the global business scene. Marketing keeps on telling us about innovation. If the product you are going to sell abroad is just the same product they have in their own country, then what will be your edge? It will neither entice nor persuade them for product trial. Filipino businessmen needs to be more creative and innovative especially if the goal is to go global. Our government can help our businessmen in becoming a global brand by supporting them. The government should provide financial support or budget especially on research and innovation. Also, they have the power and authority to build linkages with other country. If the government is able to build strong linkages globally, then it will be much easier for them to help our local businessmen in bringing their business in the global market. As what they say, it takes two to tango, the government and local businessman must work together because the success of a certain business in the global arena, is also the success of the nation. Finding a trustworthy foreign partner or right importer to market and sell your product in another country is an issue for Filipino businesses. The country has many products for export, but to find somebody to receive it on the other end to do the distribution and selling of the product is a major concern. Philippines is a small country, thus getting in, be identified and accepted in the global scene needs a lot of effort. 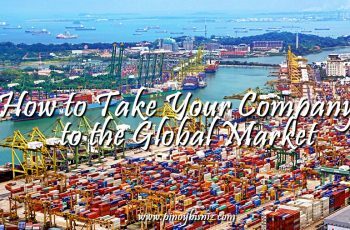 A right importer who has the right market for your product in another country will give you a lot of help not just in marketing side, but also in complying with the local norms and regulations. The Philippine government can help address this concern, by organizing trade fairs overseas and domestic to allow local exporters to showcase their products. The government can invite possible foreign importers who already has a good business credibility in marketing local products. Furthermore, the government can also organize trainings to help educate the business people in terms of exporting and competing globally. I think the other concerns which filipino business people has to address when competing globally, inorder to explore the name of your products in other countries, not only in the Philippines but in the global economy. The government should do for local busineses, the government should do for free advise for the regulations of the local business. Examples for the tax incentive program, or the research development grants from the local government unit. Financial assistance that the government can grants for the local business. 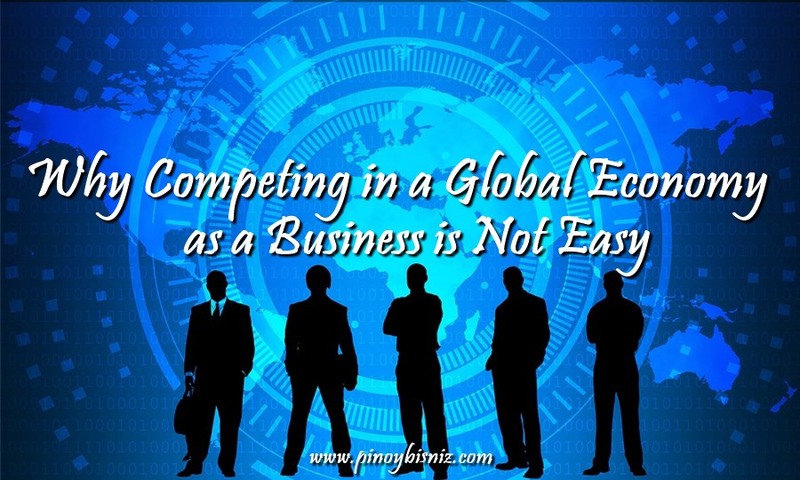 Other concerns are which Filipino Business People has to address when competing globally are: 1) Product to choose (choose the right product to export and have a business plan); 2) Investment of Money (Make sure that the money you invest is worthwhile); and 3) Management (There should be benefits and good income for the employees to really operate the business properly).